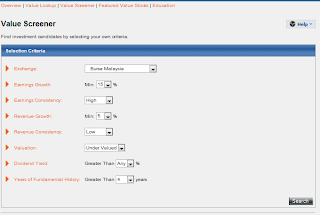 This is the 2nd part of the posting on RHBINVEST's RHBScreener which does stock selection based on the fundamental aspect of a company. 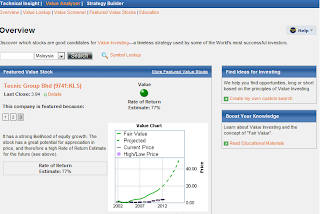 This method of selection is commonly known as Fundamental Analysis or FA. 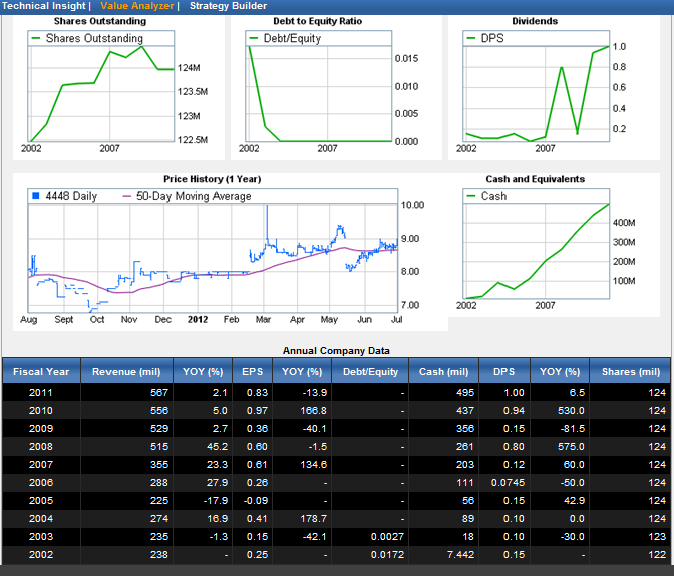 Since a lot of the financial information is summarized into graphs, it is very easy to digest the relevant information. 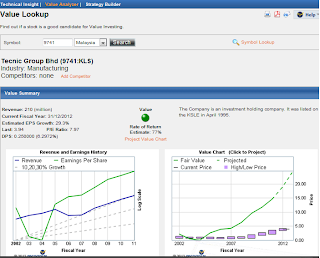 If you decide to look up the fundamental analysis of your preferred stock, you can type it in to let the screener work its magic. 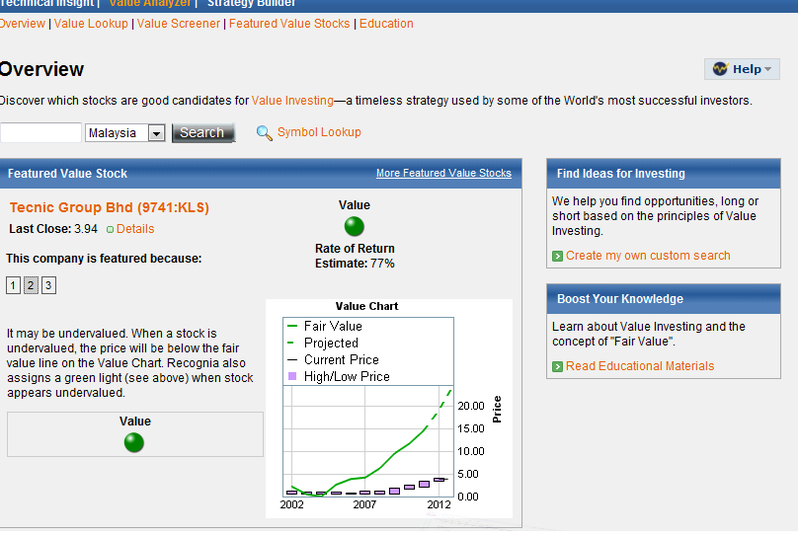 It will show the revenue & earning history, the fair value, current value, and high/low price for a certain time frame. 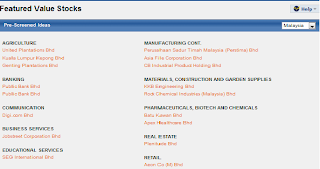 Also given is the information on the outstanding shares, debt to equity ratio, dividend per share (DPS) and the current cash level holdings for your selected stocks. 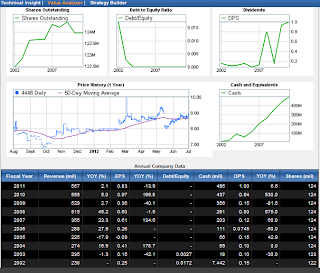 The good feature provided here is that you can do a PDF printout of all the financial graphical information using a simple click on the top right of the page. 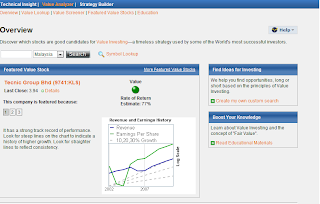 If you are in a bargain hunting mode, you can use the "Value Screener" to find stocks that fit certain financial criterias. 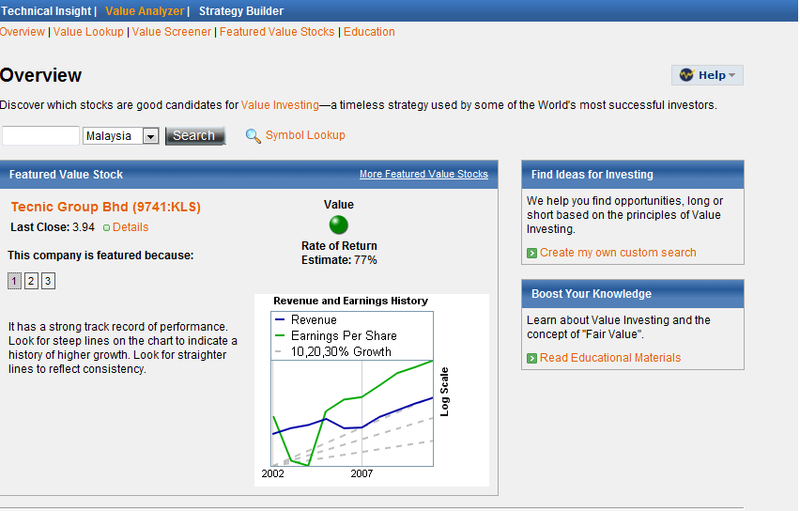 Using the example below, I am searching for a stock that has a minimum earning growth of 15% and revenue growth of 5% over a 4 financial year period. 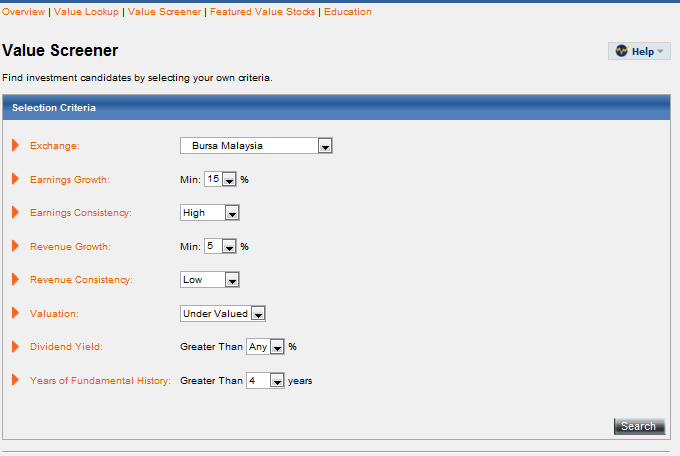 Of course stocks that fit my financial selection above is not many, as shown in the search result below. 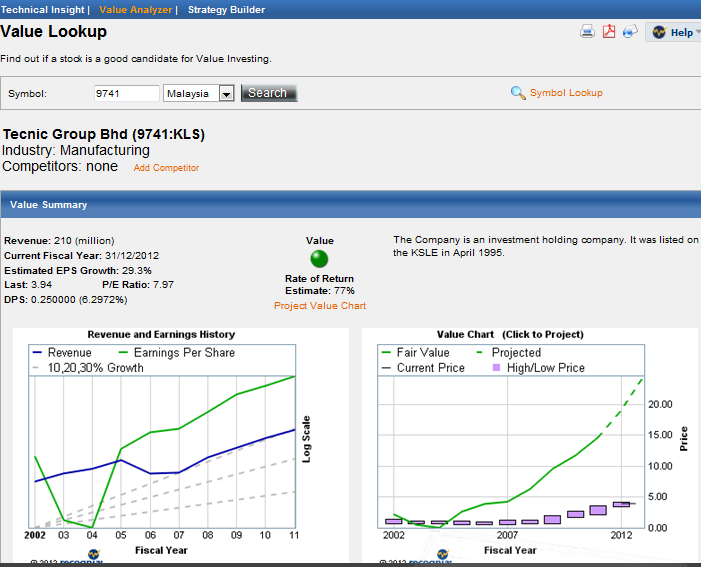 From here, you can select the "Value Lookup" to view more detail information about each individual stocks. 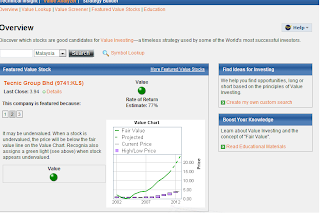 If you are the lazy type or in the search for a new investing idea, you can also do your stock picking based on the "Featured Value Stocks". 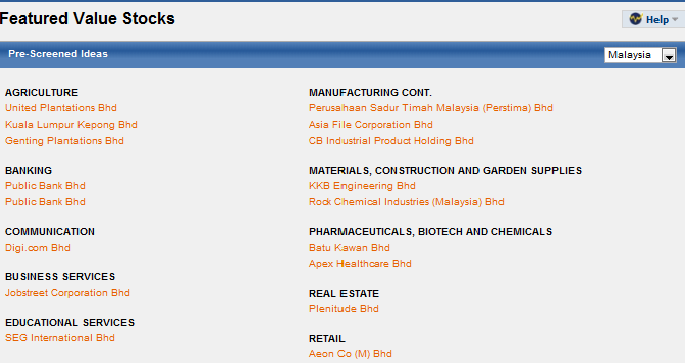 This is basically, stocks featured by the screener :) I am not sure whether this list will change on a monthly or yearly basis though. 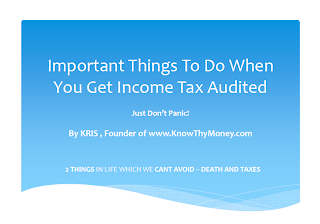 That's all folks. 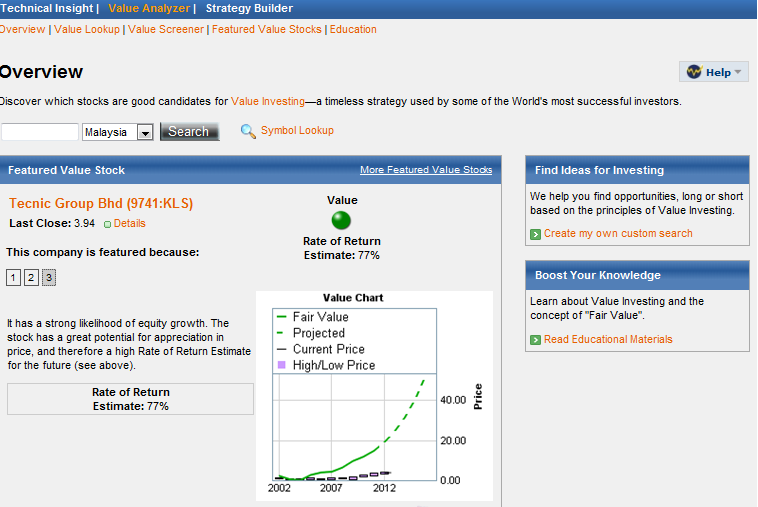 Stay tune for the last part of the RHBINVEST RHBScreener write-up which will touch on the "Strategy Builder" feature.